Lama Zopa Rinpoche teaching at Golden Light Sutra Center, Darkhan, Mongolia, May 2017. Photo by Ven. Lobsang Sherab. Lama Zopa Rinpoche with Richard Gere and Alejandra Silva at Root Institute, Bodhgaya, India, January 2017. Photo by Ven. Roger Kunsang. 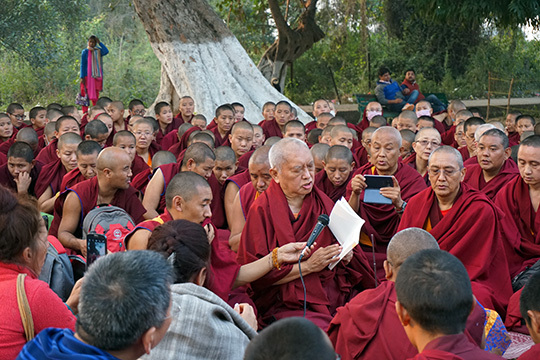 Lama Zopa Rinpoche giving an oral transmission from a Mahamudra text by Panchen Losang Chokyi Gyaltsen, Nalanda, India, January 2017. Photo by Ven. Losang Sherab. 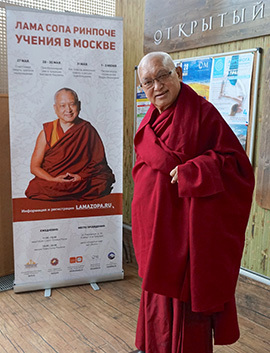 Lama Zopa Rinpoche at the venue for his teachings in Moscow, Russia, May 2017. Photo by Ven. Lobsang Sherab. Find Lama Zopa Rinpoche’s current schedule for 2017 and 2018. Work a Day for Rinpoche has become our most popular yearly campaign to support the work of Lama Zopa Rinpoche’s International Office. This year 450 students from forty-seven countries participated, offering a day of work earnings (or another amount) towards Rinpoche’s compassionate vision. All contributions were dedicated on Saka Dawa, June 9, when the merit generated was 100 million times more powerful! We rejoice, and thank all who contributed. 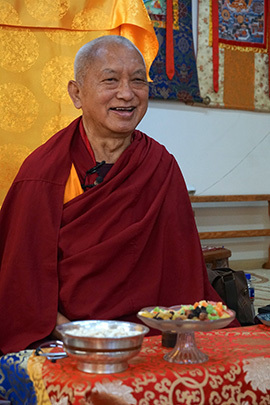 Lama Zopa Rinpoche teaching in Moscow, Russia, May 2017. Photo by Renat Alyaudinov. “A Long Life Prayer for Lama Zopa Rinpoche” spontaneously composed by Rangjung Neljorma Khadro Namsel Drönme (Khadro-la) with revised English-language translation by Lama Zopa Rinpoche. (Translations of the first English translation are also available in Chinese, Italian, German, and Spanish). “A Requesting Prayer to Maratika: The Source of an Ocean of Siddhis” by Khenpo Gyurme Thegchog Gyaltsen, translated into English by Lama Zopa Rinpoche. This prayer is a concise guide to the holy places and holy objects of Maratika, the site of the caves in eastern Nepal where the great master Padmasambhava (Guru Rinpoche) achieved immortality with the dakini Mandarava. We’re pleased to announce that we’re putting the finishing touches on the new issue of Mandala, which will be arriving in the mailboxes of supporters of Friends of FPMT very soon. The new issue features teachings from Lama Yeshe, Lama Zopa Rinpoche, and the late Khensur Rinpoche Lama Lhundrup; the health of Buddhism in the Himalayas; the first graduation of Himalayan geshemas; and the power and importance of ritual in Tibetan Buddhism. Check out our recently published feature interview with journalist Vicki Mackenzie about her new book The Revolutionary Life of Freda Bedi: British Feminist, Indian Nationalist, Buddhist Nun [get a copy through the Foundation Store and support FPMT International Office’s work]. Although relatively unknown, Freda Bedi made an incredible impact on the shape of Tibetan Buddhism and helped facilitate its survival in exile and its spread to the West. Mandala is a benefit of the Friends of FPMT program. Sign up today! FPMT’s 15th International Sangha Day is on July 27, which is Chokhor Duchen, the Buddha multiplying day commemorating the Buddha’s first teaching. 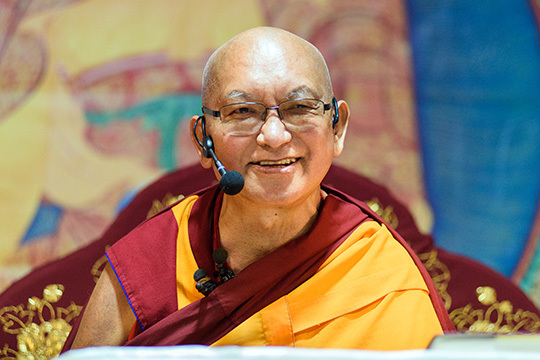 This is the day when all centers, projects, and services are encouraged to celebrate the Sangha with suitable events and by donating to the Lama Yeshe Sangha Fund. All FPMT policy is captured in one list for your convenience. Et maintenant, le règlement en français aussi—thanks to the French Translation Service. Please check out the regularly updated meritorious opportunities to offer service as a volunteer or as paid staff in FPMT centers, projects, and services around the world. For example, Mahamudra Centre, New Zealand, needs an operations manager. 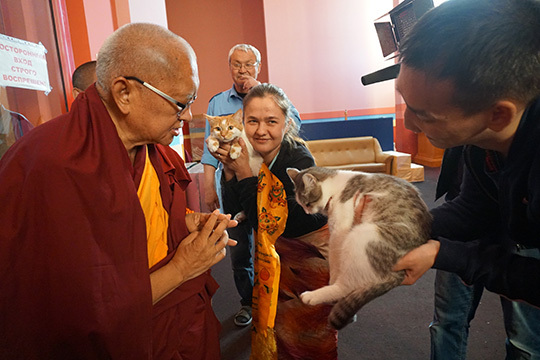 Lama Zopa Rinpoche blessing cats before giving Vajrasattva initiation, Kalmykia, Russia, May 2017. Photo by Ven. Lobsang Sherab.